We had a great time at the beach despite the threat of rain upgrading to actual rain. But it was dry for five hours and the fresh air and hint of sunshine did us all the world of good. 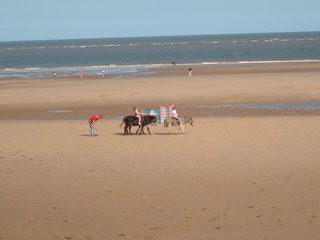 I didn't realise until we reached Mablethorpe that dogs are allowed on all beaches except the central beach. We could have brought the pooch after all. There were no crowds, you could hear the waves, build sandcastles and loads of clean, fresh air with a relaxed drive there and back. Exactly why I left London...that journey to Southend or Clacton...Bleugh! I feel suitably chilled and ready to face a return to the vets tomorrow with a poorly cat. Despite the antibiotics she is still limping and has now stopped using the poorly leg altogether. She might only have three usable legs but she ain't 'arf hard to catch. I'm orf to shower away the sand and thence the Monday night quiz. "Essay, essay, essay....My dog's got no nose".